Jen is a professional member of the American Massage Therapy Association and received her massage training from Bancroft School of Massage Therapy in Worcester, MA. She holds advanced certification in Clinical Sports Massage, Orthopedic Massage, Myofascial Release, Active Isolated Stretching, and flexibility training and a certified in Kinesio Taping Practioner from The Kinesio Taping Association International. She received a Bachelor of Science degree in Athletic Training from Russell Sage College, Troy, NY. She started her massage career at the Southern Saratoga YMCA in Clifton Park, NY in 1996. She served as both a certified YMCA strength training instructor and a massage therapist. 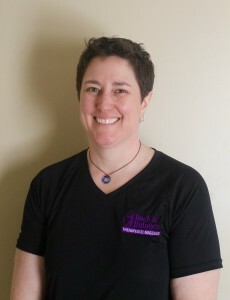 Jen is the Sports Massage Instructor at Center for Natural Wellness School of Massage Therapy in Albany, NY. She is also the Sports Massage Therapist for University at Albany’s Athletic Program and has been a part of numerous championship teams. Her areas of specialty include clinical sports massage, orthopedic massage/injury recovery, myofascial release, and chronic pain management. She has provided sports massage at many events including The Ironman USA Triathlon in Lake Placid, NY, the Boston Marathon and Freihofer’s Run for Women in Albany, NY. She has been a Captain of the Massage Tent at the Ironman USA Triahtlon for the last 17 years. She believes that regular massage is a priority in the lives of her clients and helps them achieve optimal health and wellness. In Spring of 2003, she was awarded “Outstanding Sports Massage Achiever” from the New York State American Massage Therapy Association in addition to receiving the “Entrepreneur of the Year” award from the Southern Saratoga Chamber of Commerce.